WASHINGTON, D.C., August 29, 2018 — The Earth's magnetic field extends from pole to pole and is strongly affected by solar wind from the sun. This "wind" is a stream of charged particles constantly ejected from the sun's surface. Occasional sudden flashes of brightness known as solar flares release even more particles into the wind. Sometimes, the flares are followed by coronal mass ejections that send plasma into space. The resulting flux of charged particles travels millions of miles from the sun to the Earth. When they arrive here, the particles wreak havoc on the Earth's magnetic field. The result can be beautiful but also destructive: auroras and geomagnetic storms. The storms are serious and interfere with a number of important technologies, including GPS signaling and satellite communications. They can also cause damage to surface electrical grids. Solar activity appears random, making it difficult for us to predict these storms. In the journal Chaos, from AIP Publishing, a group of investigators from Europe, led by Reik Donner at Potsdam Institute for Climate Impact Research in Germany, reports a new method for analyzing magnetic field data that might provide better short-term forecasting of geomagnetic storms. This new method relies on a technique developed for systems in a state far from equilibrium. Earth's magnetic field fits this paradigm because the field is driven far away from equilibrium by the solar wind. Systems that are far from equilibrium often undergo abrupt changes, such as the sudden transition from a quiescent state to a storm. The investigators used hourly values of the Disturbance storm-time, or Dst, index. Dst values give the average deviation of the horizontal component of the Earth's magnetic field from its normal value. This deviation occurs when a large burst of charged particles arrives from the sun and weakens the field generated by the Earth. The Dst values form a single stream of numbers known as a time series. The time series data can then be recast into a 2D or 3D image by plotting one data point against another at a fixed amount of time into the future for forecasting. Here, the authors created a diagram known as a recurrence plot from the reconstructed data. The recurrence plot is an array of dots typically distributed nonuniformly across the graph. 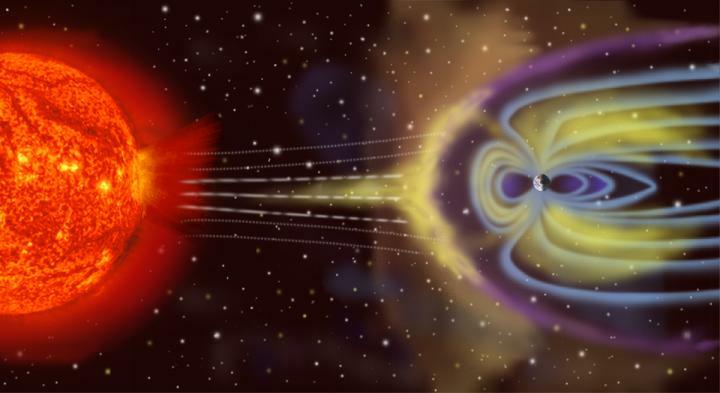 The authors used their data to look at a pair of geomagnetic storms that occurred in 2001 from large solar flares a couple of days prior to the storm. The article, "Temporal organization of magnetospheric fluctuations unveiled by recurrence patterns in the Dst index," is authored by Reik V. Conner, Veronika Stolbova, Georgios Balasis, Jonathan F. Donges, Marina Georgious, Stelios M. Potirakis and Jurgen Kurths. The article appeared in Chaos Aug. 28, 2018, (DOI: 10.1063/1.5024792) and can be accessed at https://aip.scitation.org/doi/10.1063/1.5024792.